I had to pleasure of a three day weekend this weekend as I’d booked Friday off of work to basically just play video games, and play video games I did! I continued on with some more of The Shadow of Mordor, I’m just over half way through the game now, and the I’m continuing to record the gameplay and post it to our YouTube channel, so please check it out if you fancy it! I’d also picked up Alien: Isolation during the week for the paltry sum of £24, so on Friday I got the chance to try it out. Now, I’m only an hour or two in to the game so far. But my early impressions are that it’s great. I’m generally pretty terrible with scary games. I just can’t bring myself to play them, I can do it in small doses, but usually I just get to scared and wimp out. But with Alien being one of my favourite film franchises, and Aliens being one of my favourite films of all time, I just had to play this. Plus it was one of my highlights from this year’s EGX, so, you know, that meant I had to play it even more. The game starts off with Amanda Ripley being told that the flight recorder from the USCSS Nostromo has been found and taken to Sevastopol station, she tags along with a small team on the Torrens in hopes of finding some closure on what actually happened to her mother Ellen Ripley. Upon reaching Sevastopol, the team find that comms are dead, and the station looks all quiet. They attempt to board the station via a space walk, but as you can imagine, it doesn’t quite go to plan, and everything kind of goes a little FUBAR from that point on. 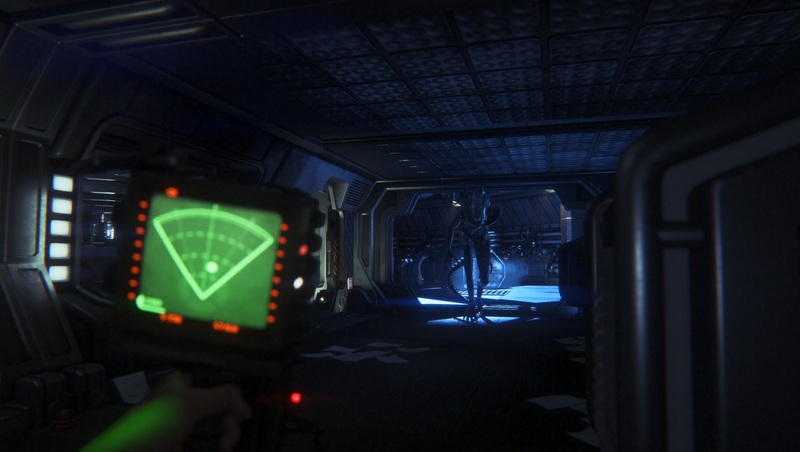 Creative Assembly have completely nailed the retro Sci-fi feel of the Alien films. The sounds and sound track are chillingly atmospheric, and immediately give you the creeps as soon as you set foot on the station. Like I’ve said, I’m only a little way in to the game but I’ve already jumped numerous times at little explosions, and any little bump or suspicious footstep. Obviously this game is mainly about Ripley facing off against the Xenomorph, well I say facing off, but it’s more like running and hiding from it. So with such a big emphasis on the Alien, it has to be spot on, and from what I’ve seen so far, it is. Granted I’ve only glimpsed it once in the full game, but I got pretty close during my EGX demo. It’s terrifying, and truly is deadly. Make too much noise and you’re dead, try to run and you’re dead, basically if you’re spotted by it, you’re dead. I maintain that H.G Giger’s Xenomorph is the best alien creature ever created, so I have a pretty high standard of what to expect from it in a video game. So, far I’m impressed with all of it. But time will tell if that impression lasts… That’s if I can bring myself to carry on playing it. I didn’t really get up to much else over the weekend. The odd bit of Destiny and NBA here and there, you know, the usual. 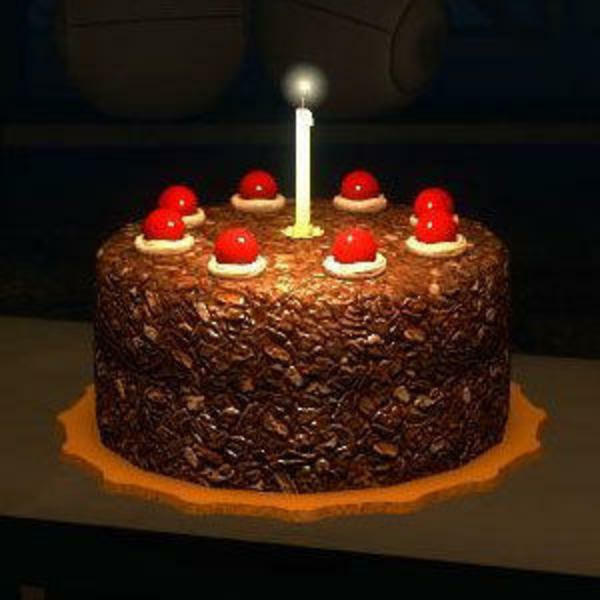 This weekend however was a pretty special one for GEEK.SLEEP.RINSE.REPEAT, as it’s our 1st birthday! Yup, we’ve now been up and running for 1 whole year. So, I would like to take this opportunity to thank each and every one of you who has shared a post, or liked something on Facebook, followed us on Twitter, liked our blog posts or subscribed to us on YouTube. Basically anyone who has given us support, we’re really grateful for all of it. And we can’t wait to grow over the next year and years after that. THANKYOU! HAVE SOME CAKE. Well, that was a weekend without much rest! Friday was a work colleagues last day with us, so we went out to celebrate Friday night. It always had a feel that it’d be a heavy one, and that turned out to be correct. I cannot remember the amount of alcohol consumed or where we went. Other than the final destination which was a very big dive of a club. My night finished at 3am, with kebab meat and chips (standard) and a lift home from my wife. But no rest for the wicked as I’d already agreed with my wife that we’d spend Saturday shopping for flooring and other living room items as we’re in the final stretch of getting the house completed. So up early and feeling a little delicate we went out looking for ideal flooring. Ended up coming home with stuff completely unrelated to flooring, but at least we found some and will be ordering soon. Once back from the chore, I went over to GSRR’s #1 fan’s place to play some NBA2k15. We’re currently playing a league with the Hornets and have made some pretty decent trades to ensure our starting 5 are all minimum 80 rated and no older than 26. Currently flying with 9 losses and over 30 wins. Still no joy against the Cav’s currently losing the series 2-1. From there I went home and played NBA on my own PS4 creating my character and spending my VC. I’m a Toronto Raptors player and have been handed a 2nd 10 day contract to impress. Here’s hoping I get a year contract soon. Sunday again was without a lie in as I went out with my parents to get some spices for when making curry’s. Random I realize, but we’ve got lots of nice sized spices for a very cheap price from this place rather than getting minuscule amounts from a supermarket for near double the price. Once back I hopped onto NBA again playing it the majority of the afternoon, and then the usual WWE fans came over and we played more of the NBA season with the Hornets till WWE Hell in a Cell started. The results will be up here later today so keep an eye out. As Will mentioned we’re 1 year old! Hooray! hopefully you’ve enjoyed our content this past year, and will stick around and follow us for more. We’re chuffed with the response and interaction we’ve had from you over the year and look forward to the future. Here’s hoping that we’ll be eligible for press passes for gaming conferences one day.